Walter Laqueur as been hailed as "one of our most distinguished scholars of modern European history" in the New York Times Book Review. Robert Byrnes, writing in the Journal of Modern History, called him "one of the most remarkable men in the Western world working in the field." Over a span of three decades, in books ranging from Russia and Germany to the recent Black Hundred, he has won a reputation as a major writer and a provocative thinker. Now he turns his attention to the greatest enigma of our time: the rise and fall of the Soviet Union. 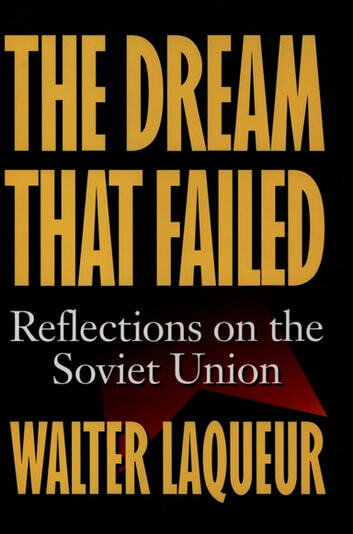 In The Dream that Failed, Laqueur offers an authoritative assessment of the Soviet era--from the triumph of Lenin to the fall of Gorbachev. In the last three years, decades of conventional wisdom about the U.S.S.R. have been swept away, while a flood of evidence from Russian archives demands new thinking about old assumptions. Laqueur rises to the challenge with a critical inquiry conducted on a grand scale. He shows why the Bolsheviks won the struggle for power in 1917; how they captured the commitment of a young generation of Russians; why the idealism faded as Soviet power grew; how the system ultimately collapsed; and why Western experts have been so wrong about the Communist state. Always thoughtful and incisive, Laqueur reflects on the early enthusiasm of foreign observers and Bolshevik revolutionaries--then takes a piercing look at the totalitarian nature of the Soviet Union. We see how Communist society stagnated during the 1960s and '70s, as the economy wobbled to the brink; we also see how Western observers, from academic experts to CIA analysts, made wildly optimistic estimates of Moscow's economic and political strength. Just weeks before the U.S.S.R. disappeared from the earth, scholars were confidently predicting the survival of the Soviet Union. But in underscoring the rot and repression, he also notes that the Communist state did not necessarily have to fall when it did, and he examines the many factors behind the collapse (the pressure from Reagan's Star Wars arms program, for instance, and ethnic nationalism). Some of these same problems, he finds, continue to shape the future of Russia and the other successor states. Only now, in the rubble of this lost empire, are we coming to grips with just how wrong our assumptions about the U.S.S.R. had been. 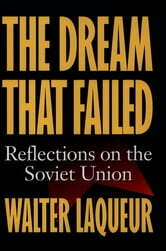 In The Dream That Failed, an internationally renowned historian provides a new understanding of the Soviet experience, from the rise of Communism to its sudden fall. The result of years of research and reflection, it sheds fresh light on a central episode in our turbulent century.